The technology known as direct LED backlighting has gone mainstream, as discussed in the latest IHS Markit Display Backlight Market Tracker. Global shipments of TVs featuring direct LED backlighting—also known as direct-lit LED—accounted for a whopping 77% share in Q2 2017, where it stayed for the rest of the year, up from 69% the same time in 2016. 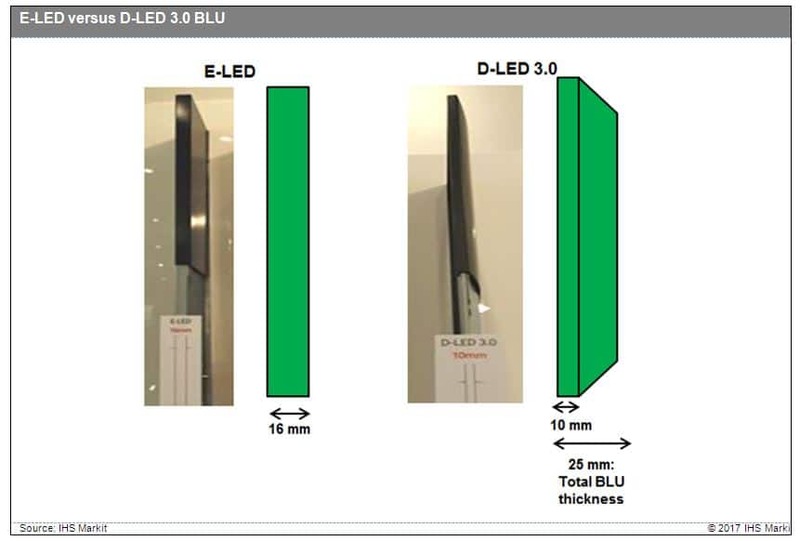 Direct LED has been used since 2014 in various ultra-high-definition TV models for both the entry and mainstream TV segments, which has led to a progressive decrease in shipments of TV panels using the rival edge LED backlighting technology, as shown in the chart below. The difference between direct LED and edge LED lies in the placement of the LED backlight units, determining each technology’s benefits as well as drawbacks. In direct LED technology, the LED light sources are installed at the back of the LED panel. In contrast, the backlights in edge LED are located on the edges of the display panel, usually on opposing sides of the display, facing in toward the TV. Direct LED backlighting can help lower panel-manufacturing cost. Fewer LEDs are required compared to edge LED, and light-guide plates are not needed given that the LED arrays are situated directly on the back of the backlight rather than at the sides. However, direct LED backlighting is comparatively thicker than edge LED—the latter is best for a slim design—because the LED array of direct backlights must be kept at a specific distance from the diffuser plate in the backlight module. Even so, it is this gap, also known as optical distance (OD), that enables the uniform and bright illumination of the TV backlight prized in direct LED. The biggest benefit from direct LED backlighting is local or 2D dimming, a feature that dims the backlight behind areas of the screen that display black. Necessary for LCD TVs featuring High Dynamic Range (HDR), 2D dimming allows for greater contrast, so that blacks appear darker and deeper when film or video is viewed; HDR is not possible with edge LED. Some panel and TV set makers have also been working to reduce the thickness of direct LED backlights. Already, the OD of direct LED backlights has decreased to 15-18mm today, compared to 25-50mm in the past, allowing for much slimmer TV profiles. The newest development is D-LED 3.0, in which direct LED backlight modules are 10mm thick with an OD of 15mm, yielding a total backlight module thickness of just 25mm, with very narrow edges. The key to reducing backlight thickness is by resolving uniformity issues, like what is being carried out by Samsung Electronics, which uses a specially designed second lens along with an increase in the number of LEDs to help achieve uniform illumination. For 8K displays and large sizes, however, some panel makers are considering a different direction altogether. As discussed in the Market Insight “Micro-LED display opportunities in the competitive display industry,” panels featuring micro-LED backlighting technology cannot compete at present with LCD or OLED in mainstream applications like TVs, tablet PCs, notebook PCs, desktop monitors, and smartphones, with LCD and OLED expected to continue dominating in these areas. Instead, the most promising initial applications for micro-LED display technology are likely to be smartwatches, public information, and automotive. But rather than developing micro-LEDs for displays, panel makers are developing micro-LED backlights to offer the benefits of both thickness and HDR for high-end televisions, including 8K TVs in the 65-inch, 75-inch, and 80-inch-and-above sizes. Panel makers believe that micro-LED backlight technology can achieve high-performance HDR and an ultra-slim structure at the same time—two features not possible before in tandem. The biggest advantage of micro-LED backlighting is a thinner form factor, with displays as slim as 10mm, allowing micro-LEDs to compete with high-end direct LED backlights and OLED TVs. Micro-LED chips measure a mere 0.1mm in thickness, and a second lens for boosting luminance efficiency is not needed. In comparison, the height of an LED chip together with the lens package in traditional direct LED backlighting measures 6-8mm. This means the OD is greater, as shown below. With a micro-LED chip and a smaller OD, the entire backlight module can be as thin as 10mm, compared to 24-25mm for direct LED. A second advantage is that micro-LED backlights can achieve better HDR with more zones for local dimming, as more LED chips are utilized than in direct LEDs. And because micro-LED backlights use smaller LED chips, more uniform light distribution can be achieved. Micro-LEDs can also reduce panel-manufacturing cost, since both the traditional wire bonding and frame of LED arrays are not needed. Moreover, micro-LEDs can utilize flip-chip-on-modules (FCOMs), providing additional cost savings given that the flip-chip requires neither a second lens nor a package. It must be noted, however, that FCOM requires revising the current backlight design, which would result in additional overhead that could prove onerous to smaller players and makers of small backlight module systems. Micro-LED technology requires the use of more LED chips, translating into higher power consumption. While a 75-inch 8K television may need 1,000 direct LED chips as the light source, at least 70,000 chips would be needed in micro-LED, with power consumption 1.5 times greater than that used by direct LED backlighting. Given the high number of micro-LED chips that must be installed on the backside of panels, heat dissipation will be critical. Although not a major issue when it comes to color binning—as micro-LEDs for backlighting are white in color and therefore have no color function—luminance uniformity could still be affected. Color binning is the process in which LEDs are tested and sorted. The key technology for producing micro-LEDs is the transfer method, in which equipment constraints and an immature process are known limitations. Production time for micro-LED could be 10 times longer than that for a direct LED, raising costs as a result. And because the technology is comparatively new, overall reliability remains to be proven.